Leafing through How to be a Domestic Goddess the other night, I saw Nigella’s treatise on Victoria sponges and although she didn’t have a chocolate one, I was inspired by her to create my own for the Cornwall Clandestine Cake Club, CCC. The theme was afternoon tea, so what could be more appropriate than a Victoria sandwich? I was also inspired by Karen’s drinking chocolate cake over at Lavender and Lovage, so decided to use a drinking chocolate mix rather than cocoa. As I was planning on using the vanilla apricot jam I made before Christmas, I was hoping this would make for a lighter taste, which would allow the apricot and vanilla flavours to shine through. Creamed 250g unsalted butter with 240g vanilla (caster) sugar until very pale. Beat in 4 duck eggs, one at a time, mixing in a little of the flour in between each egg to stop curdling. Stirred in 210g flour (half wholemeal, half white), 50g drinking chocolate, and 2 scant teaspoons of baking powder. Added about 4 tbsp of milk to make a loose, but not runny mixture. Divided mixture between two 21 cm cake moulds and baked at 180C for 20 minutes until firm on top and cake tester came out clean. Spread one half with a jar of my vanilla apricot jam. Whisked 150 ml double cream until soft peaks formed. Spread cream over the top of the jam and placed the other half on top. One of my cakes broke up a little when I turned it out, a rare occurrence for me as I use silicone moulds; I am always taken aback when it happens and not best pleased. Luckily, I managed to rescue it by gluing most of it back together with the jam and using it as the bottom layer. My goodness that jam was good. The cake wasn’t bad either. Others thought so too and demonstrated their appreciation by coming up for seconds – no mean feat with the vast array of cakes available. Our CCC event was held at Lanhydrock, one of our local National Trust estates which is just up the road from us – in Cornwall terms anyway. The meeting was held in one of the offices away from the main house, a pleasant corner of the estate I’d not seen before. The converted stables, recently revamped, made an excellent location for our gathering. The cakes were many, splendid and varied. To top it all we had an informative and entertaining talk by Sue Bamford on the surprisingly dramatic history of afternoon tea. Who knew that a married woman in Victorian times could entertain a male guest in her dressing gown for tea, but was unable to do so fully dressed for dinner. Inspired by Nigella as it was, I’m entering my Hot Chocolate Victoria Sandwich to Forever Nigella, created by Maison Cupcake and this month hosted by Jen of Blue Kitchen Bakes. The Theme is Easter and I reckon this would make a perfect cake for Easter tea. As I used four very large duck eggs which were coming to the end of their useful life, I am entering this to the No Waste Food Challenge, created by Kate of Turquoise Lemons and this month hosted by Elizabeth’s Kitchen. The theme this month is eggs. Although most of my bakes are entirely made from scratch, I don’t often remember to submit them to Javelin Warrior’s Made with Love Mondays, but I’ve remembered this time. This sounds delicious! I too had a cake break up on me recently when cooked in a silicone mould. It was a double layer cake and BOTH cakes stuck the mould! I am wondering if my buttering the moulds first was to blame… I too was most displeased. I love that you’ve used duck eggs in this recipe, and drinking chocolate – it sounds fantastic! Thanks for entering it into the no waste food challenge! Oh My Goodness! That cake looks SO delicious! All the cakes look wonderful, but OH MY GOODNESS! I’m so glad I managed to bring a slice of this home with me – it was about the only thing that got me through my rubbish day yesterday! That’s an amazing array of cakes! I love a bit of apricot jam in a chocolate cake. What a beautiful cake, Choclette! I love the rustic layering and the contrast of color between the cream and cake… This sounds delicious and I’m so happy you remembered to share 😉 And love the new banner for your blog! Fantastic! This sounds like a lovely combination of flavours. 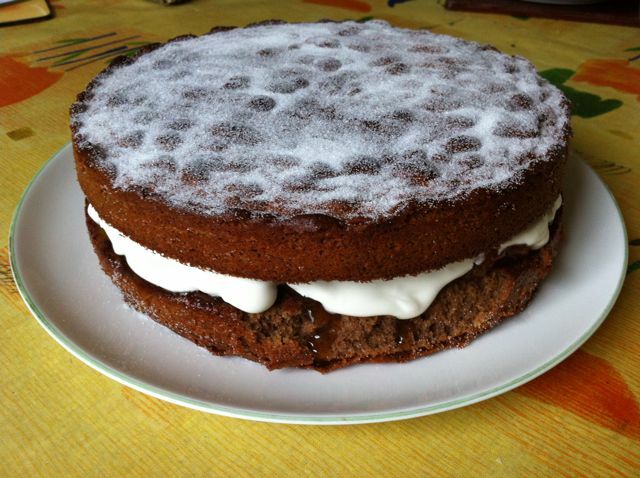 Your CCC cakes look so good – how lucky to have your meeting at Lanhydrock!! Wow! Your whole site is drooltastic. Heavenly, i could just die looking at all of those lovely cakes. You are such a talented baker. Thank you for sharing this with us. Looks like a delicious cake. I have to confess that I usually skip over apricot jam when filling chocolate cakes, for some reason my mind immediately jumps to red/black fruit. I’ll have to give apricot a go too. Looks like you had a fab time and a wonderful selection of different cakes. Gorgeous cake and inspired flavours as always, chocolate with that vanilla apricot jam sounds simply heavenly! I really like apricots. When I go over to Italy in the summer I can eat as many as they can fit in my belly 😉 they are gorgeous fruit. Pairing them with chocolate is a great idea. Really lovely post Choclette. The cream sounds yummy! Hope you will be joining us again this month for Forever Nigella. I love Victoria Sponge. Your one is great. WOW all those cakes look mouth watering! I must admit I enjoy the decorating of the cakes more than the baking. I am very arty so presentation counts everytime. You always present your baking so well too – a true expert! Thank you!